028. ANTARCTIC ADVENTURE. Issued by Sanitarium Health Food Co. (probably for Weetabix, although not noted as such) (1985) in a series of 20. Unclear whether these were issued in Australia or New Zealand (not noted). Size: 2.9" x 2.15". 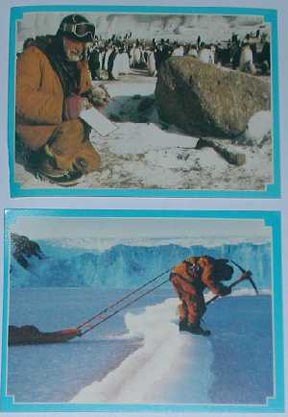 Recto: Color photographs of various Antarctic subjects, as listed below. Blue border with narrow white rule separating view. No. 2 As the pack-ice inscreases, it's hard to find a channel. Because the ice is continually shifting, it's necessary to watch for fresh openings, then sail through. No. 3 One of the huge Emperor penguins sayshello. Penguins fish from the coastal fringe of the continent. Emperors dive deep - up to 46 metres. No. 4 A scientist fishes for specimens of local marine life. Notice the background rocks. Even in Antarctica, the land sometimes shows through. No. 5 A ridge forms in the ice where two great sheets press together, highlighted by the last rays of the autumn sun. Winter in this region is one long night or twilight, sometimes brightened by the moon or stars. No. 6 Frozen specimens of Antarctic fish. Ninety per cent of the region's deepwater fish are found nowhere else in the world. Fish from other regions could not stand the freezing water. No. 7 Observing the wind speed. Antarctica is battered by raging blizzards, sometimes strong enough to toss tractors through the air. And when a blizzard begins, it can continue for weeks. If you lean against the wind and it drops - you can fall flat on your face. No. 8 Here's 'the tip of an iceberg' Icebergs form by breaking off the edge of the glaciers on the mainland. Note the huge glacier in the background of this shot. No. 9 Weddell seals can live under huge sheets of ice by cutting holes in the surface with their teeth. Here a seal, in the foreground, has come up to breathe. Behind, scientists record the 'song' of the seals with a microphone suspended in the water under the ice. No. 10 Sheltering from a 112 km/h wind on the ice-covered sea. If something goes wrong with the tent, food, clothes or heating, you can quickly die. The margin of safety in Antarctica is very slim indeed. No. 11 The birth of an iceberg. This huge chunk has just broken off the glacier behind it ... and is slowly turning over. Notice how smooth it is on the side that has been underwater. Ice is still falling down its face. No. 12 Once, dogs pulled the sleds. Now, there's the snowmobile. Here, one has jammed the rig in rough ice. This kind of problem can happen many times a day. No. 13 The conditions near the South Pole often cause strange lighting effects. These are 'sun dogs', a natural refraction phenomenon. No. 14 The hardy birds of the Antarctic have amazing endurance. Penguins spend their lives on ice or in freezing water. One Stormy Petrel was found 16,093 km from where it had been tagged. It had flown across the pole and half-way round the world ... in just two months. No. 15 An Emperor penguin chick huddles under its father's belly. These huge birds hatch their eggs by balancing them on their fur-covered feet with a warm flap of skin above them, like a rug. And, when chicks feel cold, they crawl right back there. No. 16 Trying to catch a smaller penguin for checking. It's not really fond of the idea. Penguins cannot fly. But they swim like seals and can be found right around the Antarctic coastline. They could not survive inland because they depend on the sea for food. No. 17 Collecting mosses and lichens. The only plant life on the continent is this simple kind. How could big plants survive screaming blizzards and months without sunlight? No. 18 A small ship chugs through thick and rotten ice. When the bow rises high enough on the ice, the weight of the ship breaks through. Notice the clear channel behind it. No. 19 A natural arch in the ice. Notice the man standing beneath it? And the huge icebergs in the background? Any ship that anchored in this sunny cove would soon be crushed by the grinding bergs. No. 20 Two adventurers pulling sleds. This is called 'man-hauling'. They are trudging through boot-deep snow over sea-ice. The ridge in the background could be the shore.